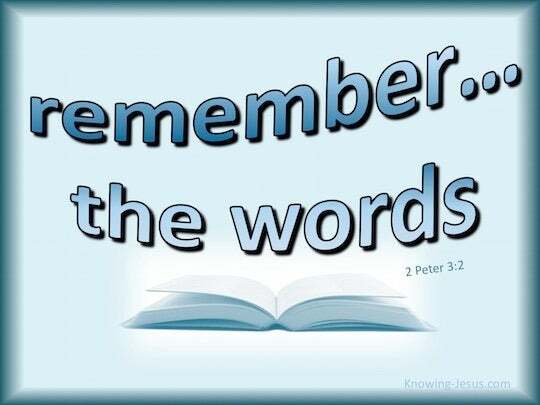 ﻿ 2 Peter 3:2 that you should remember the words spoken beforehand by the holy prophets and the commandment of the Lord and Savior spoken by your apostles. to remember the sayings that were earlier spoken by the holy prophets, and of the command of your apostles of the Lord and Savior. That you should recall the predictions of the holy (consecrated, dedicated) prophets and the commandment of the Lord and Savior [given] through your apostles (His special messengers). to remember the words spoken to you in the past by the holy prophets, and what the Lord and Savior commanded you through your apostles. So that you may keep in mind the words of the holy prophets in the past, and the law of the Lord and Saviour which was given to you by his Apostles. that you should remember the words spoken beforehand by the holy prophets and the commandment of the Lord and Savior spoken through your apostles. by admonishing you to be mindful of the predictions of the holy prophets, and of the directions of the apostles of our Lord and Saviour. to be mindful of the words before spoken by the holy prophets, and of the commandment of us, the Apostles of the Lord and Saviour. to remember the things foretold by the holy prophets, and the command of the Lord and Savior through your apostles. to remember the words which were spoken before by the holy prophets, and of the commandment of the Lord and Savior by us, the apostles. to call to remembrance the words which were told before of the holy prophets, and also the commandment of us; the apostles of the Lord and Saviour. to have you recollect the words spoken by the holy prophets beforehand and the command given by your apostles from the Lord and saviour. I want you to recollect the words that were foretold by the holy prophets, and the command of your Lord and Saviour, given you through your apostles. To remember the fore-spoken declarations made by the holy prophets, and the commandment of the Lord and Saviour, by your apostles. I want you to recall what was foretold by the holy Prophets, as well as the Command of our Lord and Savior given to you through your Apostles. 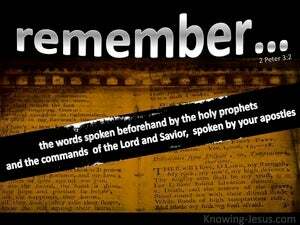 to remember the things foretold by the holy prophets, and the command of the Lord and Saviour through your apostles. that ye remember the words spoken before by holy prophets, and the commandments of the Lord and Savior by your apostles.